The HPP General Assembly is composed of all Principal Investigators (PI) of the C-HPP and B/D-HPP program research teams, and the members of the HPP EC, HPP SSAB, and HPP scientific working groups. 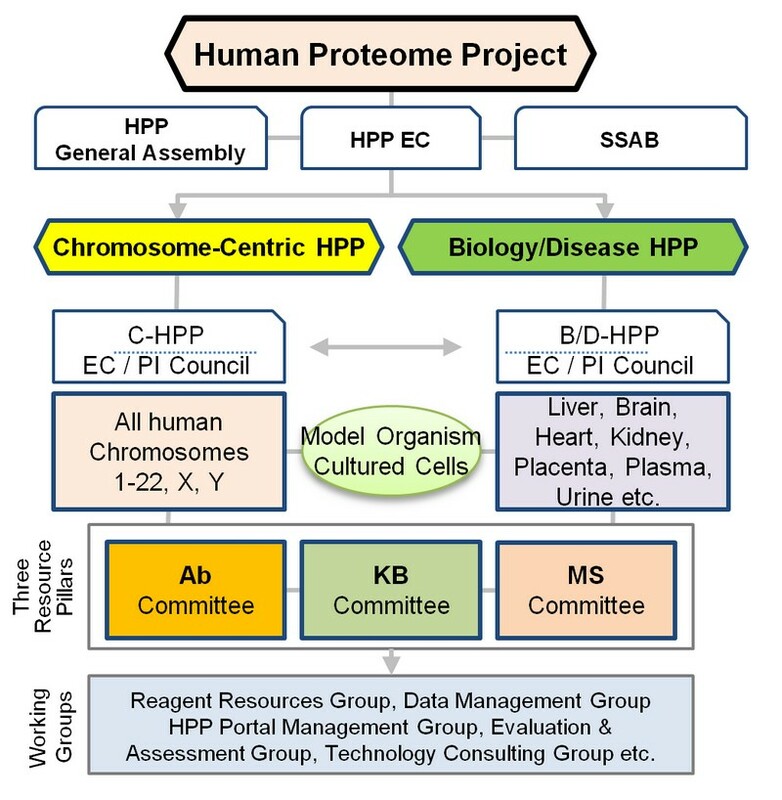 The overall structure of C-HPP consortium which is composed of several committees such as Executive Committee, General Management Committee and Scientific Committee. We describe the key functions of each committee as below. Rationale: The collaboration needs an efficient leadership to reinforce the overall policies and run the everyday tasks of the project. However, the collaboration can only be successful if it makes maximum use of the creativity and energy of the participating research teams. Thus, the Executive Committee needs to be established and this committee will coordinate with the participating chromosome-based teams and perform routine management duties. Membership: The C-HPP EC will consist of a chair, two co-chairs, and two members-at-large designed by the General Management Committee (GMC) members (see below). Responsibilities: The EC will perform the following specific tasks. Administrative support: meeting arrangements, communication among the consortium members, financial matters, soliciting private support for the research, and managing consortium operational expenses. Authorship: The EC will decide upon publication priorities and timing in consultation with the direct participants to the paper and set authorship guidelines, including for author inclusion in relation to roles in the work. Sharing of data with those outside of consortium will be a fundamental principle of C-HPP. Examples of information that would include list of proteotypic peptides, expression data, subcellular localization data and profiling data, in either normal and/or disease samples. Decision Making Process: The consensus will be always favored. In case a decision cannot be taken by consensus, the EC will forward the issue to the GMC for decision. A quorum consists of 60% of the EC. Decisions of the EC will be based on majority votes but, in all cases, a consensus will be highly preferred as the outcome. Election of EC members: While all chromosome PIs will be eligible for election to EC, to achieve geographical diversity we will use the principle and method that will be adopted from the rules set by the HUPO Nomination and Election Committee. The EC members will be elected by the respective principal investigators (PIs) who represent each specific chromosome. Each PI will get one vote. In order to achieve continuity, four members (chair, two co-chairs, one member-at-large (MAL) will be elected for a term of three years. The second MAL will be elected for a term of two years at the beginning of the EC. EC members are eligible for re-election without any term limit. Voting right of each GMC membership will be determined by GMC meeting held prior to EC election. In the first year of the C-HPP consortium, chair of HUPO initiative committee and a member elected from HUPO IAB will serve as MAL. Their terms are two years for the former and one year for the latter, respectively. Membership: This committee consists of the representative PIs or Co-PIs participating in the C-HPP Consortium. In the case of more than one claim to become PI of a chromosome initiative, the EC will request from the concerned individuals a status report on their plan and results achieved during the last 6 month time period. EC will review both proposals and make a decision as to the successful applicant. The unsuccessful applicant will have the right of appeal to HUPO EC. A quorum consists of 60% of voting members. Chair of EC will become a chair of GMC. Staff members (e.g. non-paid secretary, non-paid treasurer) serving GMC can be appointed by EC. Responsibilities: The basic responsibility of GMC members is to ensure effective direction of the individual projects, coordination across the C-HPP Consortium, and cooperative activities set by the consortium. One member of the GMC will serve on the Evaluation and Assessment Committee (below). Membership fee: There will be a nominal fee for this membership that will be used for general activities not covered by any sort of grants or support from outside. Each member will pay the annual membership fee to HUPO based on an invoice issued by the consortium. The consortium will follow the procedures set by HUPO IAB for transaction of the membership fee and budgeting of the consortium. The fee structure and time of fee collection will be determined by GMC. Decision making process: A quorum consists of 60% of the evaluation committee using HUPO criteria (e.g., call-in). Decisions of the GMC will be based on consensus as often as possible. In case a vote is required, the majority of votes will be necessary for implementation of the decision (i.e. irrespective of a quorum). Membership: The Scientific Committee (SC) is intended to be comprised of the top scientific leadership of all aspects of genomics/proteomics. The committee will consist of representatives from the GMC member or leaders of related fields, genomics, bioinformatics, protein chemistry and others. Appointment of SC members is governed by EC based on the recommendations from the members of GMC and outside consortium such as HUPO initiative committee members. A C-HPP EC member can serve as a member of the Scientific Committee but cannot be the chair. One member will serve as Chair of the scientific committee who can be chosen by GMC. The chair can appoint non-paid secretary who will manage the routine administrative works. The Chair will also serve on the Evaluation and Assessment Committee (see below). Responsibilities: The SC will be responsible for providing technical leadership in terms of promising emerging technology as well as reviewing scientific standards for the C-HPP and will include grant preparation, sample selection/phenotypic criteria, genotyping, analyses, and manuscript preparation. Technically, this Committee should govern or advise the whole HPP and thus statements described here may also be appropriate for the whole HPP. Decision Making Process : A quorum consists of 60% of the evaluation committee. Decisions of the SC will be based on majority votes. keep the C-HPP in touch with perspectives of research efforts impacting on the C-HPP, including the output of the B-D HPP. Membership: At least one member from the EC and at least one member from the Scientific Committee will serve on the EAC. This should include the chair of each of the two committees. The chair will also serve on the GMC. At least two additional members will be appointed who are not members of the C-HPP and who have appropriate expertise for evaluation and assessment. Decision Making Process :A quorum consists of 60% of the evaluation committee. Decision will be made by majority vote. The DMC will oversee construction and maintenance of the C-HPP database, quality control of the database, and all associated analyses. It will also coordinate prospective collection and replication of data sets and aid in the design of new studies to be included in the consortium. It will assess the proposed plans of researchers who seek to join the consortium. The RSC will coordinate supply and management of reagents for the consortium. This committee will contribute to the atmosphere of collaboration and sharing by adhering to the operational procedures and guidelines outlined here. Not only does this facilitate the mission of the C-HPP in accelerating the discovery process for protein characterization, it also promotes C-HPP’s members’ scientific aspirations and project objectives by providing access to key reagents and resources. Membership will be composed of those individuals recommended by the GMC and approved by EC. [Bioinformatics] Peter Horvatovich (Wiki), Ron Beavis (GPMDB), Eric Deutsch (PeptideAtlas), Amos Bairoch (neXtProt), Lydie Lane (UniProt), Juan-Antonio Vizcanio (ProteomeXchange), Juan Pablo Alba(PRIDE).